We’d love your help. Let us know what’s wrong with this preview of Daughter of Destiny by Nicole Evelina. In the war-torn world of late fifth century Britain, young Guinevere faces a choice: stay with her family to defend her home at Northgallis from the Irish, or go to Avalon to seek help for the horrific visions that haunt her. The Sigh Before queenship and Camelot, Guinevere was a priestess of Avalon. She loved another before Arthur, a warrior who would one day betray her. To ask other readers questions about Daughter of Destiny, please sign up. Daughter of Destiny by Nicole Evelina is a 2016 Lawson Gartner Publishing publication. This is the first book in an Arthurian trilogy, which tells the story from Guinevere’s perspective. This first book gives the reader insight into Guinevere’s early life, her visions, and pagan religion. She is sent to Avalon in hopes of controlling her haunting and disturbing visions, which is where she meets her ultimate rival, Morgan. As she grows up, she falls deeply in love and becomes a priestess. But, her promising future is thrown into complete disarray when tragedy strikes, and she must return home. She is stunned to see Northgallis is not the place she once knew, where her own beliefs are dangerous. From this time forward, Guinevere and her destiny will become legendary. It has been a long time since I read anything Arthurian or in the fantasy genre. At one time I was heavy into ‘Camelot’ and loved all the romance, magic and tragedy of these epic tales. But, that was many, many, many years ago. There are a few Arthurian series I’ve been meaning to read, but somehow, I never seem to manage to make time for them. So, it was fortuitous that this trilogy popped up on my radar. My mood was just right for this type of story, as I feel an ever -increasing desire to lose myself in something as far from reality as I can muster. It should be noted that this series is something akin to a re-telling, but also puts a fresh spin on the story of Arthur, Lancelot, and our queen- Guinevere. So, don’t expect the story to follow any strict rules or guidelines from previous works on this subject. The classic tale is simply the foundation upon which the author chose to build her own unique version of events. I must say I like what I’m seeing, so far. The author certainly knows her subject and has given us a fascinating look at Guinevere’s early life, before she married Arthur. The emotions, dialogue, history, locations, pacing- basically everything is quite impressive! Now, with some classic stories, tinkering around with a version that is set in stone, one that conjures up a specific image in one’s mind, is akin to blasphemy. However, Camelot and Arthurian legends have been told so many ways, so many times, with countless liberties taken, and is a story that begs for an alternate outcome. I can’t see why anyone would blow steam if this story is re-imagined yet again, as it is here, especially as it is done with such incredible skill. I enjoyed this first installment and have already queued up the next book in the series. I even feel a rare tingle of anticipation… Stay tuned! When I saw this book, I was instantly curious because I've always felt that legend did Guinevere a great injustice by disregarding her. The first 40% of the book is a bit slow and uninteresting. An eleven years old Guinevere is taken to the island of Avalon due to her gift of sight. There she is taught quite about everything (from mastering the sight, to the intricate ways of politics, from magic rituals to the art of war). She also develops a hateful relationship with Morgan, one that will mark her life. This was the part I found boring. There is not much description of the life on the island. Nor are there many events that explain Morgan's hate. At this point I was going to not finish the book. But I did, and I am happy with my choice. After 40%, the book gets interesting. Morgan fades into the background, and here we have Isolde (the heir to the throne of Ireland) making an appearance. I love her dearly. I love her free spirit and her way of finding joy in the miserable life she is forced to live by her guardian, Lyonesse. Throughout the book, Guinevere has a sort of relationship with Aggrivane, the man she meets while in Avalon and the one she gives her maidenhead to. Her being deeply in love with him does little to stop her father from giving her hand in marriage to King Arthur. Thus, the book ends with the announcement of their engagement. Now, I am curious as to what adventures await the soon-to-be Queen of Britain. This was 5 star on my enjoyable scale. Just a truly fun read- immensely entertaining. None of my interest sagged, not even within this easy read and at times closer to a YA level of base character descriptions. Regardless, it was dramatic with some vast growing up and coming of age changes. I had no idea of the Druid schools posit or of the "sight"focus or instructions toward it that hone so many of these Arthur or Merlin related sagas could reside as or "in" Guinevere's talents and legacy, as we This was 5 star on my enjoyable scale. Just a truly fun read- immensely entertaining. None of my interest sagged, not even within this easy read and at times closer to a YA level of base character descriptions. Regardless, it was dramatic with some vast growing up and coming of age changes. I had no idea of the Druid schools posit or of the "sight"focus or instructions toward it that hone so many of these Arthur or Merlin related sagas could reside as or "in" Guinevere's talents and legacy, as well. From age 9 until quite well into her womanhood- it embedded in a 5th century enchantment that surprised. And also furnished some truly human foibles in more than a handful of characters such as Galen, Morgan, Merlin, Isolde or Guinevere's Father. Or so many others that you'll know from Camelot of latter day tales. I've read far more erudite and also poetic, lyrical modes and prose for the Arthurian era. And have liked several others well enough too. But this one is definitely a series I will continue and merits much higher on the scale (compared to the others) than I thought it would. One of the things I find intriguing about this period is that the pagan and the Christian "sides" are separate, sometimes opposing- but not often as divisive of and violently apart from each other than they will eventually be at just one century later. I’ve always found it a little sad that there isn’t more Arthurian literature written about Guinevere, so I was excited when I saw this self-pubbed title pop up on NetGalley and had high hopes that it would offer some new insight or a unique interpretation of the mythology. Unfortunately, Daughter of Destiny was mostly a let down on that score. It’s a fast, easy read, though entirely unexceptional, and while Nicole Evelina may have some historical background, her knowledge of, understanding of, a I’ve always found it a little sad that there isn’t more Arthurian literature written about Guinevere, so I was excited when I saw this self-pubbed title pop up on NetGalley and had high hopes that it would offer some new insight or a unique interpretation of the mythology. Unfortunately, Daughter of Destiny was mostly a let down on that score. It’s a fast, easy read, though entirely unexceptional, and while Nicole Evelina may have some historical background, her knowledge of, understanding of, and respect for Arthurian legend and literature is marginal at best. It’s not a bad novel, but it was definitely a disappointment as an Arthurian one. We've all heard of Avalon, King Arthur, Guinevere and the legend that surrounds them. It's an old story that has been told and retold so I was curious to see what Nicole Evelina would bring to the story. Fifteen years of research have paid off for Evelina. This was a wonderful book that had me riveted throughout, only lasted me two days and had me asking my literary contact for the chance to review the next book in this trilogy. Ya, I liked it a lot. "I am Guinevere. I was once a queen, a lover, a We've all heard of Avalon, King Arthur, Guinevere and the legend that surrounds them. It's an old story that has been told and retold so I was curious to see what Nicole Evelina would bring to the story. a seductress, a misbegotten woman set astray by the evils of lust." Going into this book I admit that I knew very little about Guinevere and Camelot. I had read The Mists of Avalon years and years ago and remember that I struggled to finish it. From that book, and various movies, I knew about Arthur, Merlin, Guinevere, the sword in the stone etc but only the gist of the legend and most of what I remembered didn't have much to do with Guinevere herself. Daughter of Destiny takes the reader back to the beginning when young, eleven year old Guinevere moves to Avalon and learns about what it will take to become one of its Priestesses. There's some good rivalry between Guinevere and her nemesis, Morgan as they try out outwit each other and prove who is the better priestess. The pacing during this part of the book was a tad slower that the rest of the book but once Guinevere leaves the safety of Avalon things start to pick up as she tries to figure out where she belongs in her father's world of politics, his religion and currying favour among British nobles. Evelina has brought a lot of heart to her characters and I found it quite easy to sympathize with Guinevere. She's a sweet girl who has an inner strength that blossoms as various situations are forced upon her. She begins to use the strength and her powers that she learned on Avalon to stand up for herself, especially as it pertains to her faith which her mother and then Avalon instilled in her. She's an intelligent young woman who has compassion for others and just wants to find a place to fit in and be loved and accepted. The reason why I love historical fiction is because I get to learn a bit about history while enjoying a great story and the author's view of certain historical characters. Evelina introduces her readers to famous characters such as King Arthur, Morgan and Viviane from Avalon as well as Isolde, the feisty heir to the Irish throne who had her own influence on Guinevere. I'm glad that Evelina always kept Guinevere in the spotlight especially after King Arthur is introduced. He is relegated to a smaller story line giving Guinevere the chance to shine and the reader an opportunity to see her side of things. Guinevere is a strong-willed girl who will become a strong, intelligent woman. Since I cannot remember how things end in this legend I'm more than eager to pick up the second book in the series, Camelot's Queen which is set to be released April 12, 2016. It is evident that Evelina did a lot of research on this era as well as the druid faith and culture, politics of the time and British history. Her writing is solid, it was nicely paced and kept my interest throughout. Recommended. Some would say that we don't need another Arthurian novel. I'm not one of those people. I believe that the Matter of Britain, which is what the Arthurian myths are called by those who are centrally concerned with them, needs to get retold in every generation. I'm also still holding out for my ideal Arthurian novel. I wanted a Guinevere who could be a convincing and authentic priestess as well as a warrior. I thought that Daughter of Destiny by Nicole Evalina would give me the Guinevere that I w Some would say that we don't need another Arthurian novel. I'm not one of those people. I believe that the Matter of Britain, which is what the Arthurian myths are called by those who are centrally concerned with them, needs to get retold in every generation. I'm also still holding out for my ideal Arthurian novel. I wanted a Guinevere who could be a convincing and authentic priestess as well as a warrior. 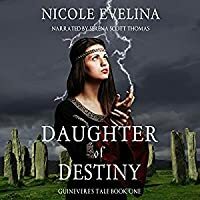 I thought that Daughter of Destiny by Nicole Evalina would give me the Guinevere that I was looking for. I received a free copy from the author in return for this honest review. When Guinevere arrived on Avalon at eleven years old, she was clearly too young to appreciate the lessons she was learning or the importance of her psychic gift. I can understand that she couldn't be an inspiring figure at that age, but I didn't expect her to manifest as the most hideous female adolescent trope in YA fiction. This was a character limned with acid. She was the Mean Girl incarnate-- obsessed with minor slights and plots of petty vengeance. I found her completely despicable. She was the opposite of sympathetic for me. Then tragedy struck and Guinevere seemed to be on the road toward maturation. At a couple of points, I thought she was in danger of a Mean Girl relapse but that didn't seem to be happening. That's a good thing because the Queen of Britain should be building alliances rather than making new enemies. Unfortunately, royal courts tend to be seething cauldrons of rivalries. Can this Guinevere rise above all the spitefulness when she wears a crown? I hope she can, but the truth is that I didn't sign on for this sort of Guinevere. So far I'm not certain she can measure up to my expectations. Looking for a historical novel that has suspense, romance and can't-put-it-down appeal? Well you've come to the right place. Daughter of Destiny by Nicole Evelina is the first book in a series about Guinevere. I for one have always been intrigued about this historical figure whether fact or fiction. This author did this story right! From the writing and detail given, it is obvious that Nicole did her research. She told this novel in little bits and pieces that just kept adding up for me. I was v Looking for a historical novel that has suspense, romance and can't-put-it-down appeal? Well you've come to the right place. 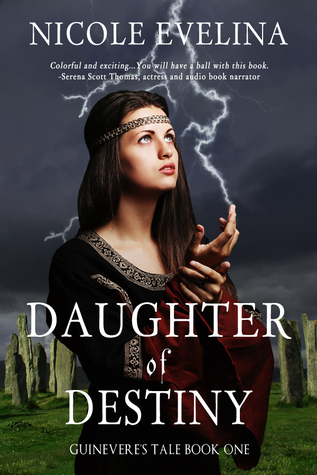 Daughter of Destiny by Nicole Evelina is the first book in a series about Guinevere. I for one have always been intrigued about this historical figure whether fact or fiction. This author did this story right! From the writing and detail given, it is obvious that Nicole did her research. She told this novel in little bits and pieces that just kept adding up for me. I was very invested in this one and can't wait for the second one to be revealed. Guinevere is dependent on no one. She is an intelligent, caring, compassionate young woman who is easy to relate to and believe in. Guinevere will tug at your heart strings and make you excited to read what happens next. Every character that plays a part in Guinevere's story is magnificent. The pace and pages of this book were perfect. Nothing was drawn out and it ended at just the right point to get you psyched for the next one. The story starts with Guinevere being shipped off from her parents and the home she loves in order to go to Avalon and figure out where her visions are coming from. She is stripped of her mother and the teaching of weapons. She is lost and alone when she arrives but quickly sees a future in Avalon. The women she learns with are like sisters to her expect for one who is always completing with her. Just when Guinevere can see a future at her new home, things happen that force her to leave. Daughter of Destiny follows a traditional Guinevere story from outside the Welsh tradition, yet still gives us a unique view. It may not be astoundingly different (it's probably impossible to do that by now anyway) and shows distinct signs of influence by authors like Marion Zimmer Bradley but Nicole Evelina deftly weaves together threads of the various tales to make an engaging story that kept me engaged without getting diverted from the main plot. This is not the typical woman portrayed in sto Daughter of Destiny follows a traditional Guinevere story from outside the Welsh tradition, yet still gives us a unique view. It may not be astoundingly different (it's probably impossible to do that by now anyway) and shows distinct signs of influence by authors like Marion Zimmer Bradley but Nicole Evelina deftly weaves together threads of the various tales to make an engaging story that kept me engaged without getting diverted from the main plot. This is not the typical woman portrayed in stories and television. This Guinevere is no flaxen-haired feminine and submissive princess: she's the daughter of a warrior queen, a tribal leader, and a priestess in her own right. At times other characters seem a little one-sided, but this is Guinevere's story. I see the sequel, Camelot's Queen, is due out soon. It's on my to-read list! I've heard of Guinevere, Arthur, Morgan and Merlin but have never read anything about them. It's not for lack of books out there, just not sure which one to start with. That was answered when I was invited to be part of this tour - thank you to HFVBT for that. Told from Guinevere's point of view she takes the reader back to medieval times. A time when Christianity was on the rise clashing with her pagan upbringing. Only 11 years old when sent to Avalon, separated from family it wasn't hard to sym I've heard of Guinevere, Arthur, Morgan and Merlin but have never read anything about them. It's not for lack of books out there, just not sure which one to start with. That was answered when I was invited to be part of this tour - thank you to HFVBT for that. Told from Guinevere's point of view she takes the reader back to medieval times. A time when Christianity was on the rise clashing with her pagan upbringing. Only 11 years old when sent to Avalon, separated from family it wasn't hard to sympathize with her plight. What I like about this book was the authentic feel to it, she is young and rather innocent with her time in Avalon showing a young girl trying her best. Having to deal with a jealous and spiteful Morgan further strengthened my connection to here. It's tragedy that brings her back home on a path to Arthur, though her heart belongs to someone else. Ever wonder about Guinevere's earlier life before Arthur? If you like Arthuriana literature, this well-written novel fills you in on Guinevere's life as a priestess and her hopes and loves long before Arthur enters the picture. By the story's end, he is in the picture but not in a way readers might have imagined. No spoilers here~read the book. Daughter of Destiny by Nicole Evelina is well written in first person, and captured my interest with a unique prologue, a simple one paragraph, that made me want to read more about a woman I thought readers of Arthurian legends knew all about. Was Guinevere a sinner or a saint -- or a lovely combination of both? Evelina took a different aspect of Gwen's life than we've been told from other authors. We are introduced to Gwen when she is sent to Avalon to become a pagan priestess at the age of eleven. At age fifteen, because of a tragic circumstance, she is sent back to the family who were strangers to her and the pagan faith of her mother. This faith clashes with Christianity. By chance, she is introduced to the new High King Arthur, a Christian, and her life changes forever when she has to abandon the man she truly loved for four years to marry another. Daughter of Destiny, Book 1 of Guinevere's Tale, is written in lyrical prose and deposits you right in the middle of medieval times. The writing is fast paced, historically correct for the era, and a page turner. I sympathized with the character whom fictional history buffs branded a lustful harlot because of circumstances that were thrust upon this intelligent, high spirited and delightful woman. Great twist at the end. Evelina's 15 years of research are a powerful addition to a fantastic read. Can't wait for Book Two. Prepare to embrace Guinevere. I feel privileged to have read this outstanding novel by a great writer. Listeners are quickly transported to medieval times in this audiobook, which stars Guinevere in her early years. Read full review in the 2017 July/August issue of InD'tale Magazine. There are a lot of different depictions of Guinevere and the story of King Arthur, Lancelot, and Camelot. One in particular that I liked was the Mists of Avalon, the movie. Such a mystical and mythical time it was. Or was it? We really do not know for sure but Nicole Evelina gives us her take and another perspective on the classic tale. Daughter of Destiny takes place before Guinevere is Queen to Arthur's King. This story starts in the Spring of 491 with Guinevere arriving on the island of Avalon There are a lot of different depictions of Guinevere and the story of King Arthur, Lancelot, and Camelot. One in particular that I liked was the Mists of Avalon, the movie. Such a mystical and mythical time it was. Or was it? We really do not know for sure but Nicole Evelina gives us her take and another perspective on the classic tale. Daughter of Destiny takes place before Guinevere is Queen to Arthur's King. This story starts in the Spring of 491 with Guinevere arriving on the island of Avalon to begin her training as a priestess. She came from wealth where her family had slaves and servants to do their bidding. In Avalon, on the other hand, she has to learn to do for herself, washing her clothes, chores etc. She is proficient in wielding a sword, though, being trained by her mother. Guinevere also has the 'sight' and this is another reason she has been brought to Avalon, to learn to control her powers. Life goes on and things are pretty normal and she meets and falls in love with a man but things are not meant to be as tragedy strikes at home and she is bidden to return home to Northgallis where she survives by her wits and her mother's ways, she is a Pagan Celt and even though there is an increased surge of Christianity she intends to follow the old ways. Her first love, Aggrivane, arrives in Northgallis and because of this relationship, she is sent to Pellinor where she is virtually treated like a slave but befriends the daughter of the household, Elaine, and Morgan another trainee from Avalon. In spite of being under lock and key if you will, she still manages to spend time with Aggrivane, even though it is against her father's wishes. The novel ends with Guinevere becoming engaged to King Arthur. Daughter of Destiny is the first in a trilogy, very well researched and thought out, if you want to learn more about Camelot and it's inhabitants, pick up this book. I eagerly await the second in the series where we learn more about King Arthur, Queen Guinevere, the threat of the Saxon's, Irish and Pict's and their invasion of Britain. Whether you believe or not, this is a story not to be missed for the historical fiction fan. I love the King Arthur legend. I’ve read more books than I can count about Camelot, etc. That is what initially drew me to this novel. I was very intrigued at looking at the tale from Guinevere’s viewpoint. If you consider the story as we know it now it all falls apart because of her infidelity. But seriously – history or in this case the legend was written by men and therefore it’s got to be the woman’s fault, right? Taking a look at the story through her eyes might be very interesting. I was ho I love the King Arthur legend. I’ve read more books than I can count about Camelot, etc. That is what initially drew me to this novel. I was very intrigued at looking at the tale from Guinevere’s viewpoint. If you consider the story as we know it now it all falls apart because of her infidelity. But seriously – history or in this case the legend was written by men and therefore it’s got to be the woman’s fault, right? Taking a look at the story through her eyes might be very interesting. I was hooked from the first paragraph. I found myself pulled into Guinevere’s world from her trip to the mystical island of Avalon at 11 years of age through her advancement to Priestess and beyond. It is a book of magic and mystery drawing on the tales of the old tribes of what is now England and Ireland. It does require releasing yourself into the time and suspending modern reality to fully enjoy the book but if you do that you will be richly rewarded. This is the first book of a trilogy and it takes you from Guinevere at 11 just up to her engagement to King Arthur. The bulk of the book covers her time at Avalon as she learns the skills and arts of being a priestess. It is also the beginning of her relationship for lack of a better word with Morgan (Morgaine). Their immediate dislike is never fully explained other than two intelligent, competitive girls trying to be number one. It seems a bit weak as the start of a hatred that causes so much trouble later on. But perhaps there is more to be revealed. If you are a fan of the Arthurian legend read this book. If you like historical fiction read this book. If you want a good story read this book. It’s a magical ride with a wonderful cast of characters – familiar if you know the story and if you don’t, you’ll get to meet them from a unique point of view. I recieved a free copy in exchange for an honest review. I can not wait to read the second book in this series! I loved it more than I honestly thought I would. I was instantly dragged into the story and found myself either loving or hating certain characters and my heart going out to them when they found themselves in terrible circumstances. I flew through this book way faster than I thought I would and enjoyed every moment of it. I loved this book. So different and so good! This book is from Guinevere's point of view. Got hooked from page one! Can't wait to read the rest in this series! I love novels about this period in which we know so little about. This was the era known as the Dark Age; we have almost no knowledge about people who lived during this time. We know that once the Romans left this area was constantly fighting, tribe against tribe, and country against country. The saga that Marion Zimmer Bradley wrote about Avalon is one of my favorites as are the movies that Hollywood did back in the 50’s. There are novels where Morgan is portrayed as a heroine and some where sh I love novels about this period in which we know so little about. This was the era known as the Dark Age; we have almost no knowledge about people who lived during this time. We know that once the Romans left this area was constantly fighting, tribe against tribe, and country against country. The saga that Marion Zimmer Bradley wrote about Avalon is one of my favorites as are the movies that Hollywood did back in the 50’s. There are novels where Morgan is portrayed as a heroine and some where she is the villain, but most novels feature Guinevere as the woman who destroyed Arthur and the legacy that he was trying to create. This novel shows both Guinevere and Morgan in a different light. The novel begins when Guinevere is sent to Avalon to learn the secrets of the old ways and how to control and interpret the visions that she has. On Avalon the Lady tells her that she is destined to wear a crown and she assumes that it will be the crown she will inherit once her father dies. Morgan is resentful of Guinevere, she is determined to be the beast and she does whatever she can to put Guinevere in a bad light. Despite everything that Morgan does, the priestesses soon realize that Morgan is not what she pretends. During the days preceding a Beltane festival where the Druids come to celebrate Guinevere meets and falls in love with Aggrivane. Once the festival is over and the druids leave Avalon Guinevere prays that the Goddess will reunite them. Guinevere is soon forced to return home when her mother dies and she finds that her father has changed and that nothing is as she remembers. Her father no longer follows the old religion and is now following the new religion of Christianity. He hates the marks that adorn his daughter brow that shows she is one of the Priestesses of the old religion. When Aggrivane arrives at her father’s castle, they continue the relationship that began on the Avalon. The situation that brought them together makes it impossible for him to declare his love until the people with whom he is accompanying leave and he can come back and then approach her father and ask for Guinevere’s hand. Unfortunately, the lovers are caught and Guinevere is Dyfed where she will be supervised by “a Christian lady” and learns how to behave as a chaste Christian lady should. During her exile she meets Isolde an Irish princess and Elaine; these names are familiar to everyone that enjoys Arthurian fiction and their fates become intertwined. It is her friendship with Isolde that enables her to endure her exile in a place where the lady who is suppose to teach her how a Christian lady should behave shows none of the compassion or charity that a Christian should demonstrate. When Aggrivane once again appears in her life Guinivere hopes that this means that the Goddess approves of their love and she once again dreams that she will be allowed to marry him. When her hopes are dashed she attempts to make the best of the situation and is determined to be a good wife and queen to the people. She realizes that the words that were spoken ny the Lady when she first came to Avalon have come true and that this is the role the Goddess wants for her. It won’t be easy, she may be Queen but her old nemesis, Morgan is now her sister-in-law and she still hates her and will do whatever she can to destroy her. I am eagerly awaiting the next book in this series. FTC Disclaimer: I received a copy of this book from the publisher via Historical Fiction Virtual Book Tours in exchange for a fair and honest review. Opinions expressed are mine. Having read The Mists of Avalon quite some time ago, I was ready to read Nicole Evelina’s version of this Arthurian legend in her new work, Daughter of Destiny (Guinevere’s Tale Book #1). Evelina did not disappoint. Taking her readers back in time to Guinevere at age 11, Evelina shares with us the pressures placed on this FTC Disclaimer: I received a copy of this book from the publisher via Historical Fiction Virtual Book Tours in exchange for a fair and honest review. Opinions expressed are mine. Taking her readers back in time to Guinevere at age 11, Evelina shares with us the pressures placed on this young one as she faces her maturing self as well as a parentless rival, Morgan. Guinevere passes every test put before her and receives the powers of priestess. In the process, she meets her first and one true love, Aggrivane. Not long after pledging their love for one another, tragedy strikes and Guinevere is called home. Once back in Northgallis, her life is challenged because of her pagan faith, outspokenness, and magical and military abilities. All these raise threatening liabilities for Guinevere. With a new king rising to power, Guinevere must be ever watchful for the dangerous status of single women–valuable commodities–and seemingly innocent acts can threaten one’s safety and life. Evelina allows Guinevere to tell her own story. I find this approach far more palatable than listening to someone else share it. Guinevere’s voice is honest, suited to her age as she grows into womanhood, and powerful. Her fellow characters are well drawn and realistic. The setting both in Avalon and Northgallis is beautifully accurate to the time in history, and I found myself transported by the magical language used by Evelina in her writing. Recommends it for: anyone who has a passion for King Arthur, Guinevere, and Britain. Life in 5th century Britain was filled with turmoil. Ms Evelina illustrates the strife between Lords and Kings plus Pagans and Christians by exploring the life of young Guinevere. At age eleven, Guinevere travels to Avalon and begins her training as a priestess. But change is in the air and after the death of her mother, Guinevere returns to her father. Fostered out to a family of devout Christians, she is tested in ways small and large. I really enjoyed reading the little details of daily life sprinkled throughout the story and look forward to reading the next stage of Guinevere’s life journey. The King Arthur story is one most of know, from Disney movies to tales of a sword, from wizards to a certain lady of the lake. This is the story of Guinevere, prior to Arthur. Yes, he makes an appearance but not until late in the book. This is the first in a series. We meet Guinevere as a very young child, she is just arriving at Avalon on her way to becoming an Avalonian Priestess. This is a well written, fascinating book. Guinevere is young, innocent and full of life. Morgan, her arch nemesis, The King Arthur story is one most of know, from Disney movies to tales of a sword, from wizards to a certain lady of the lake. This is the story of Guinevere, prior to Arthur. Yes, he makes an appearance but not until late in the book. This is the first in a series. We meet Guinevere as a very young child, she is just arriving at Avalon on her way to becoming an Avalonian Priestess. I enjoyed this tale very much. Guinevere is the strong daughter of a Roman king and a mother who was part of the Votadini tribe. Her maternal family are believers in the old religion of Avalon, and so Guinevere is sent there to study, where she meets Viviane and Morgan. There is a plot twist that makes this book an overall worthwhile read. Serena Scott Thomas did well with the narration. I received this book from a Goodreads Giveaway. It was a very good book, and I thoroughly enjoyed it. The author added enough details that I could picture each scene, without putting in so many that it bogged down the story flow. It was a very interesting take on the story of Gunivere, who doesn't get enough attention in most Arthurian fiction. The characters were mostly well written, and I especially liked some of the supporting characters. Nicole Evelina is a historical fiction, romantic comedy and non-fiction author whose four novels - Daughter of Destiny, Camelot's Queen, Been Searching for You and Madame Presidentess - have won more than 20 awards, including two Book of the Year designations. Her most recent release and first non-fiction book, The Once and Future Queen, examines popular works of Arthurian fiction by more than 20 Nicole Evelina is a historical fiction, romantic comedy and non-fiction author whose four novels - Daughter of Destiny, Camelot's Queen, Been Searching for You and Madame Presidentess - have won more than 20 awards, including two Book of the Year designations. Her most recent release and first non-fiction book, The Once and Future Queen, examines popular works of Arthurian fiction by more than 20 authors over the last 1,000 years to show how the character of Guinevere changes to reflect attitudes toward women. She’s currently finishing Mistress of Legend (September 15, 2018), the final novel in her Guinevere's Tale historical fantasy trilogy and researching two future non-fiction books: a history of feminism in the United States and a biography of early 20th century mystic Marie Rose Ferron. Nicole’s writing has appeared in The Huffington Post, The Philadelphia Inquirer, The Independent Journal, Curve Magazine and numerous historical publications. She is one of only six authors who completed a week-long writing intensive taught by #1 New York Times bestselling author Deborah Harkness. As an armchair historian, Nicole researches her books extensively, consulting with biographers, historical societies and traveling to locations when possible. For example, she traveled to England twice to research the Guinevere’s Tale trilogy, where she consulted with internationally acclaimed author and historian Geoffrey Ashe, as well as Arthurian/Glastonbury expert Jaime George, the man who helped Marion Zimmer Bradley research The Mists of Avalon. She also teaches online writing and business for authors classes at Professional Author Academy. Nicole is a member of and book reviewer for Historical Novel Society, and member of the Historical Fiction Writers of America, Novelists, Inc., BIO (Biographers International Organization); Romance Writers of America (PAN), Romantic Novelists Association, Missouri Writers Guild, St. Louis Writer's Guild, Alliance of Independent Authors, Independent Book Publishers Association, Midwest Independent Publishers Association, and the International Arthurian Society - North American Branch.